Growing up, Katie never knew her father. Her mother struggled with substance abuse, and her step father—who adopted Katie at age three—passed away when she was in elementary school. Many days, Katie would miss high school because her mother was not there to drive her, and sometimes her mother would disappear without leaving any food or money. Katie began to feel unsafe at home because of her mother’s drug and alcohol use. Katie was 15 when she was taken into custody by the Division, where she then went through two foster home placements and a youth shelter. Katie’s CASA volunteer, Sindy Finkelson, said being placed in the shelter was a turning point in Katie’s life. After this, Sindy said Katie did a major turnaround. Katie was placed with a wonderful new foster family. Sindy said the foster mother, who is a teacher, has been amazing and has given Katie direction. Now Katie is 18 and finishing up her freshman year of college. She is there on a full scholarship and is studying psychology. Katie feels a bit homesick, especially since many of the students go home on weekends. However, she is excelling academically and made the Dean’s list last semester. She and Sindy still keep in touch during the semester, and sometimes Sindy will proof read Katie’s college essays if need be. Sindy attributes much of Katie’s success to her foster mother, who Katie depends on a lot. Many times, youth who are about to age out of foster care struggle to get their lives together at such a young age. In fact, only six percent finish a two or four-year degree after aging out, even though 70% of these youth would like to attend college. Sindy said that she and Katie bonded right away and that this was very important. She commends CASA’s thorough volunteer training on maintaining professional relationships and objectivity. “[Katie] is an incredibly thoughtful, resilient, and very ambitious young woman. She has really fought to overcome many obstacles… and she knows what she wants to do. She’s really determined to break the cycle,” Sindy said, adding that Katie is also interested in helping other teenagers who are going through similar obstacles in life. 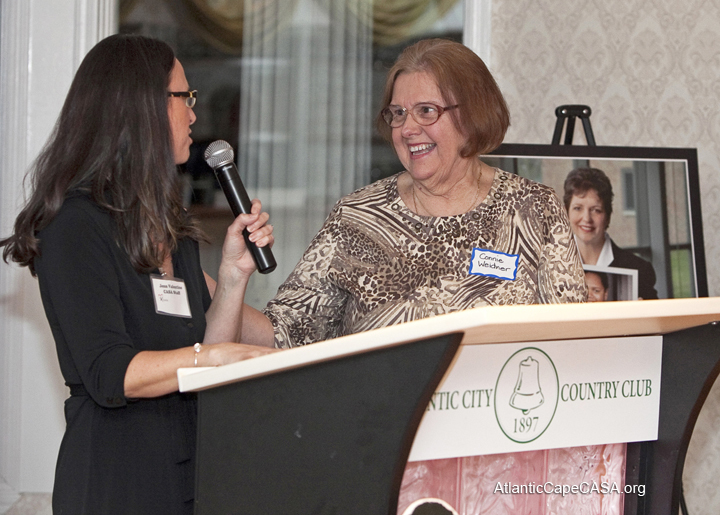 CASA volunteer Connie Weidner, of Galloway Township, is recognized for dedicating more than 10 years to advocating for two siblings in the foster care system. Congratulations, Connie!